Your online ticket store is open all the time so your customers can buy tickets and merchandise 24/7. 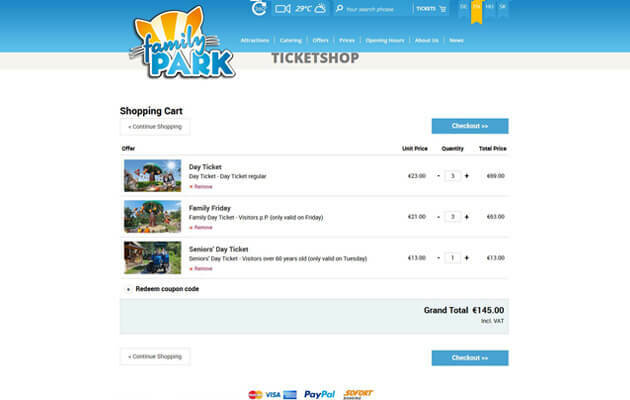 Our clients say 35% of all bookings are made outside opening hours – never miss an opportunity again..
You can promote your Amusement Park or Zoo on more than 200 websites through our sales network. This means you can reach over 150 million potential customers each month and work to maximum capacity. Adjust your price categories for children, adults or families. You can also introduce seasonal pricing to increase demand during low season. Whenever you sell a ticket online, the customer will receive a confirmation by email or text. This is a great way to improve the customer experience and save time doing everything manually. The Booking System for Amusement Parks and Zoos can analyze your sales and customer data so you can adjust your offers when needed. Hard data is always better than guessing. Ready to grow your Amusement Parks and Zoos business?